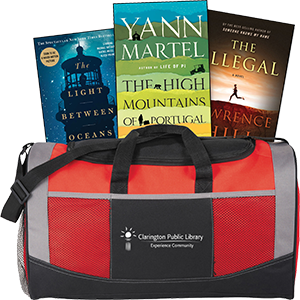 Simplify your book club selection with Book Club in a Bag! These kits contain 12 copies of book-club-worthy titles, from biography to historical fiction to suspense, along with a discussion guide. Access KitKeeper to view and request available titles. You can browse all kits, or search by month or specific kit. You can also download and print the full list of titles and their summaries. Bookings may be made up to a year in advance. Pick up your hold on the regular hold shelves. Your notification may come in a few days early, but it will remain available until your specified pick up date. Need a hand? Download the KitKeeper Instructions, or contact Information Services at 905-623-7322 x2712! $3.00 per day late fee. All 12 items are checked out to one member’s card. Only one kit may be borrowed by a member at any time. Any damages to the books/bag, or lost items. The cost of a damaged or lost book varies depending on the item. Want to discuss the choices with your fellow book club members? Download and print the full list of titles and their summaries!